Since December 30 I’ve been responding to twice-a-day prompts to report how I feel and what I am doing. 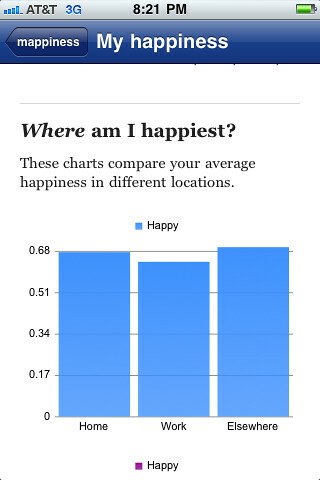 Loosely speaking I am taking part in the Mappiness research project, but Mappiness is primarily focused on mapping “subjective well being” over time and place within the U.K. No guarantee that my data is doing anything other than sitting in storage somewhere. 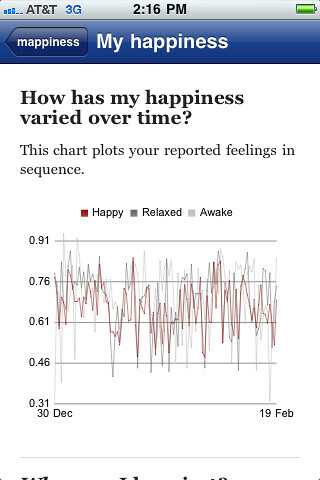 But the system provides some feedback to me, see below, which I find mildly interesting. Project creator George MacKerron explained the project and described some early research results at the recent TEDx Brighton event. 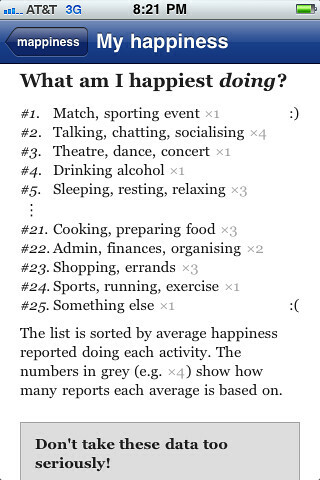 So contrary to my self-image as a quiet loner more comfortable in a stack of books, my self-reported subjective well-being data suggests I’m happier out in crowds at sporting events (#1, but note just one report) and talking/chatting/socialising (#2). On the other end of the spectrum, I’m least happy doing “Admin/finances/organising” (#22), “Shopping/Errands” (#23), “Sports/running/exercise” (#24), and “Something else” (#25, something not on their list, and perhaps fortunately I can’t remember what I was up to at the time). 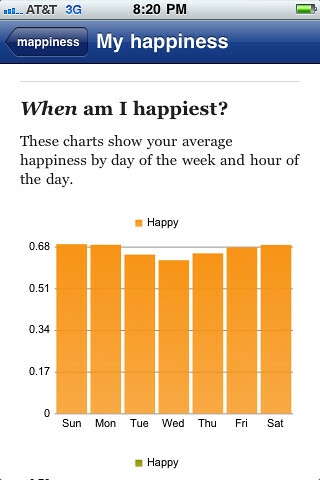 As in most of the U.K. data the MacKennon talks about, I report being happier on weekends. Not that I think you should be that interested in my data, but it gives you a glimpse of the kind of information that Mappiness is collecting. The interesting part is in the broader Mappiness project.